USS Lagarto underway, circa late 1944. Lagarto, a 1,526-ton Balao-class diesel sub, was one of 52 submarines lost during the Pacific war. Navy divers have confirmed the location of a World War II submarine believed to have been sunk by a Japanese minelayer 61 years ago in the Gulf of Thailand. Lt. Cmdr. Jeff Davis, spokesman of the Pacific Fleet Submarine Force at Pearl Harbor, said USS Lagarto was first discovered in May 2005 by a commercial diver. It was one of 52 submarines lost during the Pacific war. Last month, Navy divers participating in an annual naval exercise confirmed the discovery first made by British wreck diver Jamie McLeod. McLeod used records from "fishermen in the area where they lost a lot of nets," Davis said. "He assumed that something on the bottom was catching the nets. "On his first dive he found the Lagarto sitting upright." The 1,526-ton Balao-class diesel sub is in 275 feet of water. McLeod has taken family members of the Lagarto to the area where he found the wreckage. Davis said no attempt will be made to raise the 311-foot sub where 86 members of its crew are entombed. "The Navy considers the ocean an appropriate final resting place for sailors killed in the line of duty," Davis said. Photographs and video of the wreck will be sent to the Naval Historical Center in Washington for further analysis. "Without a doubt it's a U.S. submarine, a Balao-class," said 7th Fleet Diving Officer Cmdr. Tony San Jose. San Jose and his fellow divers reported identifying twin 5-inch gun mounts both forward and aft, a feature believed to be unique to Lagarto. They also reported finding serial numbers and the word "Manitowoc" engraved on the submarine's propeller. 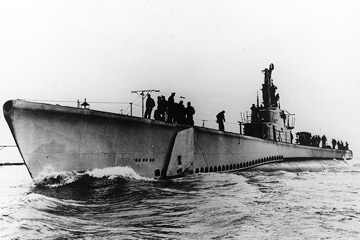 The Lagarto was one of 28 submarines built in Manitowoc, Wis.
San Jose said that the diving operations were challenging because of short bottom times, strong currents and limited visibility. Due to the depths involved, the dives had to be conducted with mixed gas. Commissioned in Oct. 14, 1944, Lagarto arrived at Pearl Harbor on Christmas Day 1944. On April 12, 1945, it left Subic Bay to patrol the Gulf of Siam, which is now called the Gulf of Thailand. On May 3, Lagarto met with USS Baya, which was tracking a tanker. Nothing was heard from Lagarto's crew after that. Last year, Rear Adm. Jeffrey Cassias, Pacific Submarine Force commander, met with Lagarto family members in Wisconsin at a memorial service held in Manitowoc. Cassias told the family members that Japanese records indicated the minelayer Hatsutaka reporting sinking a submarine near the Gulf of Siam. Twelve days later the Hatsutaka was sunk by USS Hawkbill. Cassias said, "In all, 52 submarines were destroyed during World War II, which is about the number of attack submarines we have in our Navy today. More importantly, 3,500 submariners lost their lives aboard these ships." The divers who searched for Lagarto were from the Pearl Harbor-based Mobile Diving and Salvage Unit One. The rescue and salvage ship USS Salvor and USS Patriot mine countermeasures ship also participated in the mission. The Pacific Fleet Submarine Force sent the divers to Thailand for previously scheduled international maritime exercises and asked them to stay on an extra week for the Lagarto search mission.